In this final part of our study of Indo European mythology we combine the results of our analyses of Indian, Arthurian, Greek, Norse, Irish, and Persian myths to produce composite pictures of the lives of the seven “Gods of the Indo Europeans”. In particular we are able to build with confidence upon clear similarities in both the names and themes in the accounts of two or more individual mythologies. In all mythologies we are able to see the conflicts and reconciliations of two different peoples as shown by the Tuatha de Danaan and Milesians in Ireland. We also see the strikingly similar destruction of the city of the enemies in Greek Troy and Indian Tripura, and the identical creation of the world by the sacrifices Of Brahma and his counterpart in Indian and Norse. And there are smaller but striking links between the mythologies such as the use of a sickle to kill a woman by the Greek Perseus and Indian Parashurama and the creation of a “blue-throated” individual by poison in Irish and Indian. But some of our perspectives cast previously unperceived darker shadows on some cherished images such as that of the noble Arthur. In fact we see no support for the traditional picture of Arthur as defender of Britain against the Saxons, and so placing Arthur in this British scene is simply false. There are several further aspects of his life and character that are apparently ignored by most writers. Among these is Arthur’s attempt to drown the child Mordred at the instruction of Merlin that is so clearly reflected in the story of Krishna in India as well as in other myths. Also the story of Arthur does not include the fact that the very creation of his kingship is founded on the treacherous assassination of his uncle with an arrow shown in the story of Balder in Norse and Rama in Indian. In summary we show that the wealth of matches in both names and exploits in the six mythologies is undeniable and we are indeed able to construct the elements of the lives of seven people that form the “Family of the Gods”. 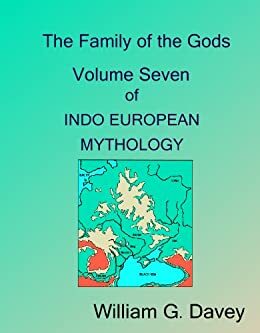 This book is a careful analysis of the family of the Indo-European gods across the main cultures-Norse, Celtic, Indian, Greek, Persian, etc. of that vast race. The author seems to imply that the gods were really a family that could have really existed on the plains north of the Black Sea. This family, in particular its patriarch, had a bit of a stormy domestic life. The book really shows just how related a large branch of humanity is and just how similar the legends of people as "different" as the Welsh and Persians really are. Must reading for anyone interested in the Old Religion. While I do not regret having bought The Family of the Gods, I have been disappointed in it. The information presented by Davey is of interest to me, but his writing style is difficult to stick with. Con: Very little documentation or helpful illustrations. Author does not explore the implications of a protons mythology in terms of placing it in historical time, which would also help us track "mutations" in the protons myth so as to date those. Another edition is needed, but I would challenge the author, if he is healthy enough, to consider series of illustrated lectures, in the way of Kenneth Clark's "Civilisation", as the material lends itself to the visual. Pro: The author exhaustively shows us similarities in indoeuropean mythological figures, each of which are fascinating in their own right, but add up to a glimpse into the mythology of the Aryan people before they swept out of southern Russia / Ukraine and admixed into numerous other peoples. As an amateur of the field it seems shocking that Davey isn't more well regarded.